For the last five years, individuals and communities have been creating memorial images to both mourn and celebrate the lives lost on 9/11. 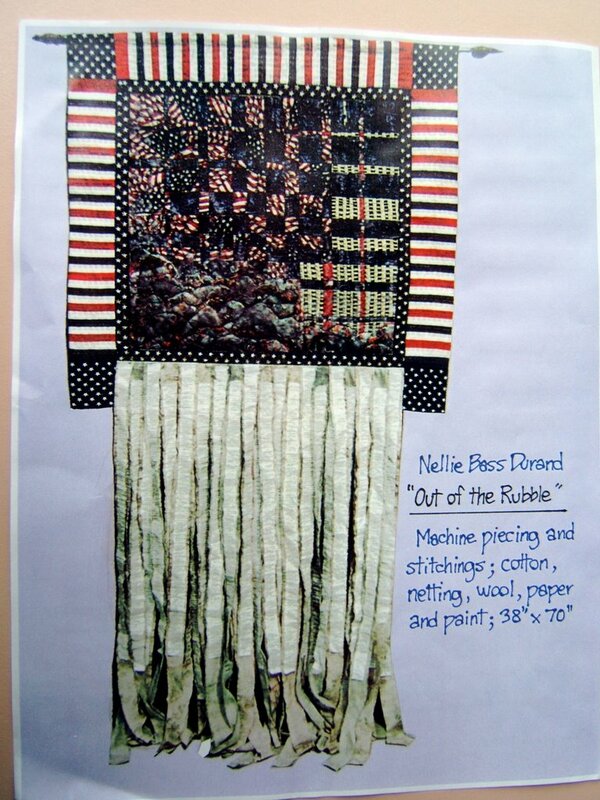 Fiber artist Nellie Durand describes the creation of "Out of the Rubble" a large quilt with every name of 9/11 victims that hung for several years in St. Paul's Chapel, located just east of where the Twin Towers stood. At some point, it occurred to me that more than death and destruction resulted from that pile of rubble. All of the love, support, strength of spirit, and help that poured out from so very many people both literally and spiritually to the people of New York City was very much a part of this tragedy. Nellie's work is simultaneously expansive and experimental while retaining a strong need for order and meaning. She saves every scrap of cloth and snippet of string. Every time she cleans a palette of leftover paint, the rag is saved, and--often times years later--it ends up being the perfect element to tie a composition together. Two weekends after 9/11, I demonstrated a quilt piecing technique (Ricky Tims Harmonic Convergence) to my daughter-in-law, Jeanette, and niece-in-law, Diane. 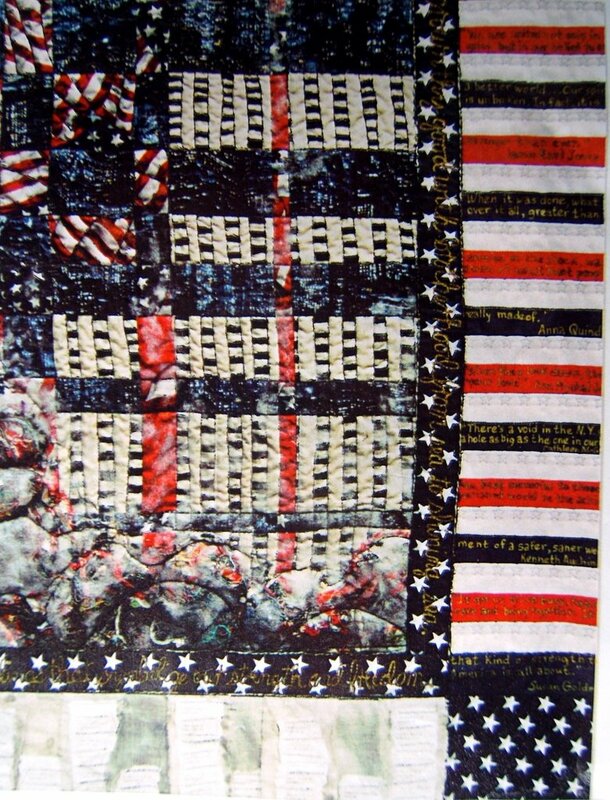 Four fabrics are required and Jeanette had brought red, white, blue, and a waving flag print to make a patriotic banner to hang from her porch in Oak Park, Illinois. She couldn't find a flag to buy. Every source was sold out. Seeing her result, I decided to make one for our cottage. The fabrics I chose were a hand-dyed red, a blue skyline print, a black/white graphic, and Jeanette's waving flag print. In the process of piecing, the three buildings of the WTC that imploded appeared. Right then I knew this piece was not just a banner. I immediately replaced all the black/white graphic pieces with the other three fabrics in the area around the buildings. About that time, someone observed that this skyline fabric depicted the buildings of New York City. I had purchased that fabric sometime ago on the chance that I just may need a city skyline for a piece I might make in the future. Nellie Durand's work can be seen at Good Goods in Saugatuck, Michigan. 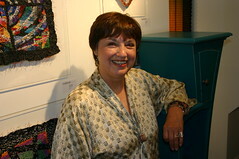 She is a frequent finalist in the highly competitive TVA quilt show in Knoxville, Tennessee. She winters with her husband and world's greatest Elvis fan, Lee, in Farragut, Tennessee.